Here is a touching tribute to Nikola Tesla written in 1915 by one of radio's early pioneers. After acknowledging the work of Hertz and Lodge, Nikola Tesla's use of electrical oscillations for transmitting signals through space is discussed. Full credit is given for the "refinement of detail" embodied in Tesla's instruments for wireless communication. Marconi, receiving his inspiration from the experiments of Hertz and Righi in electrical radiation and therefore impressed with the electric radiation aspect of the subject, regarded his transmitter entirely from the standpoint of a radiator of electromagnetic waves and it was a long time before he seemed to appreciate the real role of the earth in the operation of his system, though he early recognized that the connection of his oscillator to the earth was very material value. 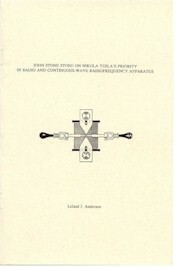 Tesla, on the other hand, approaching the subject of wireless telegraphy from a standpoint of his own powerful high frequency current experiments and their ability to transfer large amounts of energy in open circuits, regarded his transmitter from the point of view of a generator of high frequency currents and potential waves in the earth. Both were justifiable explanations of the same phenomena taking place in the Tesla and Marconi transmitters and of the two points of view, Tesla's electric earth waves explanation was the more serviceable in that it explained the important and useful function of the earth, whereby the waves were enabled to travel over and around hills and were not obstructed by the sphericity of the earth's surface, while Marconi's view led many to place an altogether too limited scope to the possible range of transmission by the system of grounded, vertical antennae. I refer to an article by Tesla in The Century Magazine in its issue of June 1900, pages 175-211, and particularly to that section entitled "Wireless Telegraphy�The Secret of Tuning�Errors in Hertzian Investigations�A Receiver of Wonderful Sensitiveness." Here as elsewhere, Tesla takes a fling at those who attribute the transfer of the energy of these high frequency currents to a distance as a process of radiation. In this he was more than half right, and whatever error be made in this connection was a failure to recognize that electromagnetic waves guided by the earth's surface, and therefore accompanied by currents in that surface, are in a sense still radiation, and that the two explanations of the phenomena are supplemental of one another and a comprehensive explanation of the phenomenon includes both the conception of the gliding electromagnetic waves and the currents in the earth's surface. I misunderstood Tesla. I think we all misunderstood Tesla. We thought he was a dreamer and visionary. He did dream and his dreams came true, he did have visions but they were of a real future, not an imaginary one. Tesla was the first man to lift his eyes high enough to see that the rarified stratum of atmosphere above our earth was destined to play an important role in the radio telegraphy of the future, a fact which had to obtrude itself on the attention of most of us before we saw it. But Tesla also perceived what many of us did not in those days, namely, the currents which flowed way from the base of the antenna over the surface of the earth and in the earth itself. Tesla, with his almost preternatural insight into alternating current phenomenon that had enabled him some years before to revolutionize the art of electric power transmission through the invention of the rotary field motor, knew how to make resonance serve, not merely the role of a microscope to make visible the electric oscillations, as Hertz had done, but he made it serve the role of a stereopticon to render spectacular to large audiences the phenomena of electric oscillations and high frequency currents. It is worthy of note that in all these experiments he used frequencies from 10,000 to a few hundred thousand. He did more to excite interest and create an intelligent understanding of these phenomena in the years 1891-1893 than anyone else, and the more we learn about high frequency phenomena, resonance, and radiation today, the nearer we find ourselves approaching what we at one time were inclined, through a species of intellectual myopia, to regard as the fascinating but fantastical speculations of a man whom we are now compelled, in the light of modern experience and knowledge, to admit was a prophet. But Tesla was no mere lecturer and prophet. He saw to the fulfillment of his prophesies and it has been difficult to make any but unimportant improvements in the art of radio-telegraphy without traveling part of the way at least, along a trail blazed by this pioneer who, though eminently ingenious, practical, and successful in the apparatus he devised and constructed, was so far ahead of his time that the best of us then mistook him for a dreamer. I never came anywhere near having an appreciation of what Mr. Tesla had done in this art until a very late date, in fact, until I commenced this study of the art.